So as promised, I'm presenting you the brochures of Metro and OG 20% off beauty events. Click below to enlarge. Afterglow Cosmetics offers free shipping with any purchase. No code needed. Valid for Mar 30 only. Askderm 30% off of $75 purchase sale has started. Enter code MM30 at checkout. Valid thru Mar 31. Bath and Body Works offers 20% off any purchase, and $1 shipping with any $25 purchase. Enter code PEACH25 at checkout. Valid thru Apr 1. Bobbi Brown offers free shipping and deluxe sample of Instant Long-Wear Makeup Remover + Crystal Lip Gloss with any purchase. Enter code WEEKEND12 at checkout. Valid thru Apr 1. Carol's Daughter offers free 120ml Almlond Cookie Shea Souffle worth $13.50 with any $40 purchase. No code needed. Valid thru Apr 1. Estee Lauder offers a free Prime & Perfect Duo with any $50 purchase. Gift includes deluxe samples of New Matte Perfecting Primer and Advanced Night Repair. Enter code MATTEDUO at checkout. Valid thru Apr 3. Hautelook is having BeingTRUE and Coola Suncare sale events. Philosophy offers buy one get one 50% off any skincare purchase. Enter code skin16 at checkout. Valid for Mar 30 only. QVC offers a TSV of T3 Set of 12 Small or Medium Voluminous Hot Rollers. Valid till Mar 31. 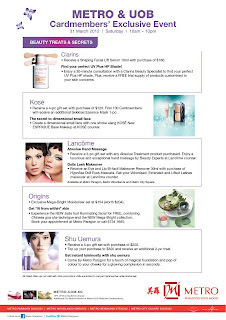 Skin1 offers 10% off any Obagi purchase. No code needed. End date unknown. Skinstore offers 20% off storewide. Enter code SPR20 at checkout. Valid thru Apr 26. Tarte Cosmetics offers free Maracuja Divine Shine Lip Gloss in #amused with any $75 purchase. Enter code amused at checkout. Valid thru Apr 1. Wei East is having a Blow Out Sale for up to 50% off. Enter thru link. Yves Rocher offers $5 off any $25 purchase. Enter code COLORS5 at checkout. Valid thru Apr 2. ZENMED offers $4 off with purchase of Stretta. Use coupon code GCJ0D0F30B7 at checkout. Valid thru Apr 6. Metro is offering 20% off sitewide again, but this time will be Mar 31 one day only. A lot of beauty brands has GWP offers as well. I only have info for Origins currently, will post more when I have them. 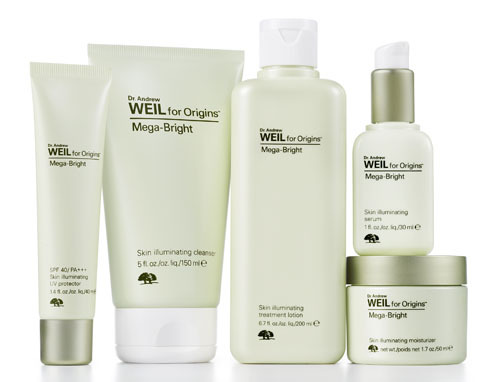 As for Origins, their promotion is buy $150 and receive 4pc treat worth $74. 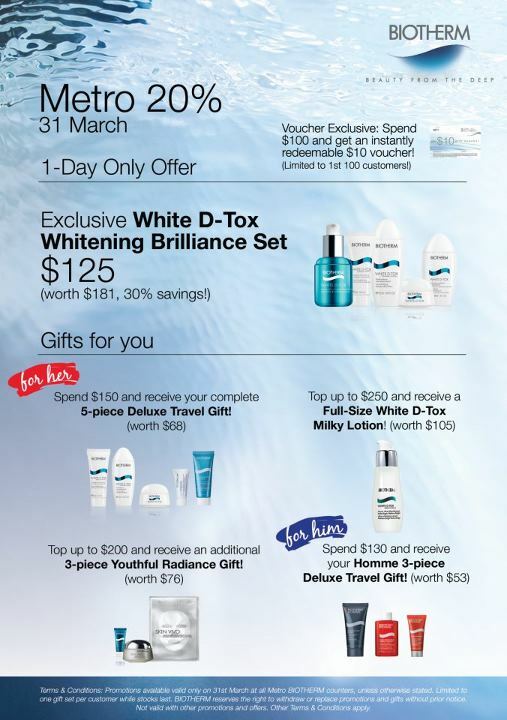 Top up to $200 and receive additional GWP. p.s. Do note that tomorrow is the last day for Kose Family Sale. I went today and grabbed several Esprique Eye Palettes - they are on sale for only $14 each (original price $46), awesome deal! Anthony Logistics offers 20% off any body products. No code needed. Valid thru Apr 3. Aromafloria offers 25% off any $40 purchase. No code needed. Valid thru April 1.
b-glowing offers free shipping and 20% off with any $75 purchase of regular-priced items. Enter code Spring12 at checkout. Valid thru Apr 3. Beauty.com offers a free deluxe sample of Elizabeth Arden Prevage Clarity Targeted Skin Tone Corrector with any $25 purchase. No code needed. Click on the banner at their homepage to get the offer in your cart. While supplies last. Beauty.com offers a free full-size Deborah Lippmann Nail Color in Dream a Little Dream of Me with any $10 beauty.com purchase. No code needed. Enter thru link. Can be combined with the offer above. Just click the link first, then click the banner after that. BioElements offers a free 2-week travel size Stress Solution with purchase of BioElements Kerafole. No code needed. While supplies last. Biotherm offers a free travel size Aquasource Skin Perfection with purchase of Aquasource Nuit at $39. Enter code AQSLP1 at checkout. While supplies last. Biotherm offers free shipping and a free deluxe sample of High Recharge Eye Shot with any $50 purchase. Enter code HREYE at checkout. While supplies last. Biotherm offers three free deluxe samples with purchase of High Recharge Eye Shot and High Recharge Energy Shot. Enter code ENERGY at checkout. While supplies last. Biotherm offers free shipping and a free deluxe sample of Firm Corrector with any $65 purchase. Enter code FIRM at checkout. While supplies last. Bloom.com offers extra $25 cashback on top of original 10% cashback when you spend $50+. Enter code SPRING25 at checkout. Valid thru Apr 2. Bloomingdale’s is having a Beauty Treats beauty event. Receive a free wrap in your choice of pink, white, or blue with any $125 beauty purchase. They have GWPs from Estee Lauder, Laura Mercier, Borghese, Kiehl’s, La Mer, Trish McEvoy, Jo Malone, and more. While supplies last. Burt’s Bees is having an outlet sale for up to 70% off. No code needed. While supplies last. Dermstore offers free two day shipping and a free Cargo Eye Shadow in Costa Rica with any $100 purchase. No code needed. While supplies last. E.L.F. Cosmetics offers free shipping with any purchase of the Lucky Look Set. Enter code LUCKYONE at checkout. Valid thru Apr 30. Elizabeth Arden offers free shipping and 7-pc gift set worth $76 with any $40 purchase. Gift includes a Red Door parfum mini, a full size Eight Hour Cream Lip Protectant Stick SPF 15, deluxe samples of Eight Hour Cream Skin Protectant, Ceramide Gold Capsules, Ceramide Plump Perfect Ultra Lift and Firm Moisture Cream SPF 30, and Ceramide Plump Perfect Ultra All Night Repair and Moisture Cream, and a red cosmetic bag. Enter code LUXE7 at checkout. While supplies last. Folica.com offers 20% off all 4 star products. Enter code STARS at checkout. Valid thru Mar 31. Giorgio Armani Beauty offers free shipping and 15% off with any $50 cosmetics purchase. Enter code EXCLUSIVE at checkout. Valid for Mar 29 only. H2O Plus offers $10 off any $30 purchase. Enter code 120125 at checkout. Valid thru May 15. Hautelook is having Iso Beauty, E.L.F. Cosmetics and Nurture Your Nails sale events today and tomorrow. Jurlique extended their spend-more-save-more event. Receive $15 off any $75 purchase with code SPRING15, $40 off $150 with code SPRING40, and $100 off $300 with code SPRING100. End Mar 29. Lab Series offers free 30ml travel size Age Rescue Face Lotion with any purchase. No code needed. Valid thru Mar 30. Macy’s is having a Scent Event. Receive a pretty gift boxed nine piece fragrance sampler with any $65 Scent purchase. They also have GWPs from many brands. While supplies last. Ouidad offers free 180ml Moisture Lock Conditioner with purchase of any Moisture Lock Creams. Enter code DREAMCREAM12 at checkout. Valid thru Apr 10. Pangea Organics offers free shipping and a free full size Facial Scrub worth $32 with any $75 purchase. No code needed. While supplies last. Sabon offers free shipping with any $30 purchase. No code needed. Valid thru Apr 1. Sephora offers free deluxe sample of Cover FX BritePrep Primer with any $25 purchase. Enter code BRITEPREP at checkout. While supplies last. Sephora offers free deluxe sample of Clarins Extra Firming Day Cream with any $25 purchase. Enter code EXTRAFIRM at checkout. While supplies last. 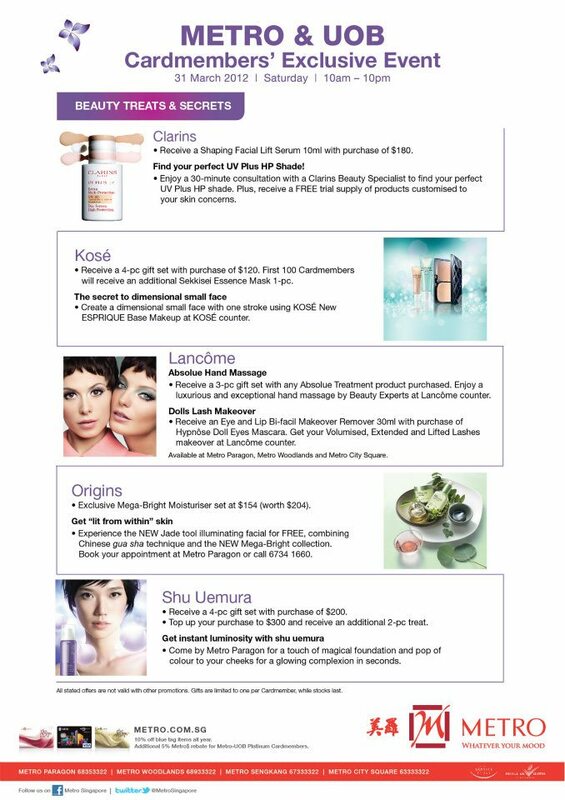 Shu Uemura offers free shipping and four free samples with any $65 purchase. Gift includes 13ml Depsea Hydrability Moisturizing Cream, 1ml Depsea Hydrability Intense Moisturizing Concentrate, 1ml Depsea Hydrability Moisturizing Emulsion, and 1ml Depsea Hydrability Alnight Quench. Enter code DEPSEA at checkout. Valid thru Apr 1. Skyn Iceland offers a free 30ml Arctic Face Mist when you spend $45. Enter code AFMM29 at checkout. Valid thru Apr 5. Smashbox offers The 3 Studio Essentials Set - Glow Getter Collection for only $29 ($88 value). While supplies last. Spirit Beauty Lounge offers a Vered Introductory Kit for only $50 (priced at $68) with purchase of any Vered Organic Botanicals product. Enter code V450 at checkout. While supplies last. The Body Shop offers 3 for $30 all Spa and Fragrance products. No code needed. Valid thru Apr 1. Walgreens offers free shipping and 20% off any $50 purchase. Enter code EASTER20 at checkout. Valid thru Mar 31. Ettusais is giving away these cute Peeling Milk Erasers with every purchase of Peeling Milk at all counters. Whiles supplies last. Kose is having their twice-a-year Family Sale tomorrow (Mar 29) and the day after (Mar 30). 10am-6pm at Great World City West Tower #12-12. AHAVA offers Buy-One-Get-One-Half-Off sitewide. Enter code MINBOGO at checkout. Valid thru MAr 31. AskDerm offers free shipping and 30% off any $75 purchase. Enter code MM30 at checkout. Valid thru Mar 29. Bloom offers $25 cashback on top of 10% regular cashback of any $100+ purchase. Enter code SPRING25P at checkout, or SPRING25VIP for VIP members. Valid thru Apr 2. Boscia offers free 10g Luminizing Black Mask with any $25 purchase. Enter code Free10 at checkout. While supplies last. Carol's Daughter offers free shipping with any $25 purchase. No code needed. Valid thru Mar 29. DermStore.com offers 20% off on items that you add into your favorite product list. 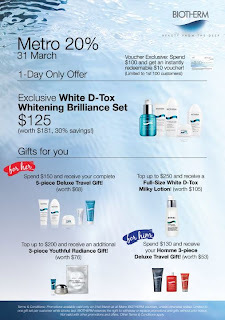 Plus receive free Murad Hydro-Dynamic Ultimate Moisturizer and Boscia Pore Minimizer Deluxe Set worth $36 if you top-up your purchase to $125. Enter code PLAYGWP at checkout. While supplies last. E.L.F. Cosmetics offers 25% off with purchase from list of 25 new Spring Items. Enter code LOVEIT at checkout. Valid thru Apr 2. Hautelook is having Skinn Cosmetics, Love Life Skin and Amir Argan Oil sale event today and tomorrow. Jurlique offers $15 off any $75 purchase with code SPRING15, $40 off any $150 purchase with code SPRING40, $100 off any $300 purchase with code SPRING100. Valid thru Mar 28. MAC Cosmetics offers free shipping with any order. Enter code PINKS at checkout. Valid thru Apr 1. Mario Badescu Skin Care has extended free shipping and 10% off with $50 purchase offer. Enter code CMONDAY at checkout. Mark. offers 2 Free hand it over hand creams plus free shipping with any $40 purchase. Use code SPRING12 at checkout. Valid through Apr 5. Md Formulations offers free shipping with any purchase. Enter code FREESHIP at checkout. Valid for Mar 28 only. NOIR Cosmetics offers 15% off any purchase. Enter code NOIR15 at checkout. Valid thru Apr 30. Ojon offers free shipping and a week supply of free Damage Reverse Shampoo and Conditioner with any $40 order. Enter code DUO312 at checkout. Valid thru Apr 30. Perricone MD offers a free deluxe sample of High Potency Amine Complex Face Lift worth $48 with purchase of any full size item from Best 5 under $75 list. Enter code UNDER75GWP at checkout. Valid thru Mar 31. Philosophy offers free surprise gift set worth $40 with any $75 purchase. Enter code bdaysurprise at checkout. Valid thru Mar 29. Prescriptives offers free shipping and a full size False Eyelashes Mascara worth $21 with any purchase. No code needed. Valid for Mar 28 only. 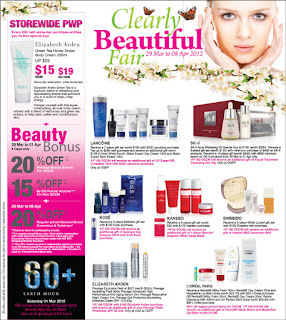 Sally Beauty offers 20% on any $50 purchase. Enter code 555129 at checkout. Valid thru Mar 29. Spalook offers $20 off any $100 purchase with code WARM20, and $50 off any $200 purchase with code WARM50. End date unknown. Aveda offers free shipping and free Smooth Infusion Sample Trio with any Litre purchase. No code needed. Valid for Mar 27 only. Beautorium offers 15% off your first purchase. Enter thru link. End date unknown. Beauty Sak offers free shipping with any $25 purchase. Enter code FREESHIP at checkout. Valid thru Apr 1. Carol's Daughter offers membership for $10 (a $25 value) and receive 20% off your purchase. No code needed. Enter thru link. Valid thru Mar 27. Chanel offers free shipping, a free signature black drawstring pouch and choose two free deluxe samples at checkout with any purchase. No code needed. Valid thru Mar 27. Chantecaille offers a free full size Papillon Veil Poudre Delicate with $200 purchase. No code needed. While supplies last. Clarins offers new Gift Sets, which include free travel-sizes of day and night creams with any purchase of full size serums. Plus select 3 free deluxe samples with every order. No code needed. While supplies last. Clinique offers free shipping with any $30 purchase. Enter code CLINIQUE at checkout. Valid thru Mar 31. Dr. Brandt offers 35% off any purchase. Enter code EXCLUSIVE35OFF at checkout. Valid thru Apr 1. Top up your purchase to $80 and receive a free travel size Dr. Brandt Collagen Booster. While supplies last. La Mer offers free shipping and a sample of the Moisturizing Gel Cream with any purchase. Enter code START at checkout. Valid thru Apr 1. 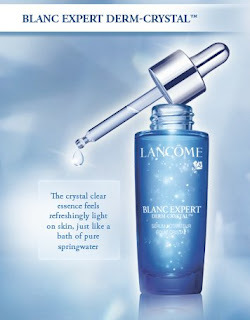 Lancome offers free shipping and five free deluxe samples with any $45 purchase. Samples include 60ml Creme Radiance Cleanser, 50ml Tonique Radiance, 7.5ml Genifique Concentrate, 7.5ml Genifique Eye, and an eye shadow quad in Kitten Heel, Honeymoon, Madison Avenue, and Montage. Enter code MARDELUX at checkout. Valid thru Mar 28. Neostrata offers free 10g deluxe sample tube of Exuviance Evening Restorative Complex with any order. Enter code DELUXE at checkout. While supplies last. Ore Henriksen offers free 30ml blue/black berry enzyme mask with any $50 purchase. Enter code MASK2 at checkout. Valid thru Mar 31. Pur Minerals offers a free All-Over Glow Face and Body Bronzer worth $28 with any $40 order, free shipping, a free All-Over Glow and a Happy Feet worth $58 with any $55 order, or free shipping, All-Over Glow, Happy Feet and Get a Little worth $80.5 with any $75 order. Enter code GLOWING at checkout. Valid thru Mar 31. Shu Uemura offers free shipping and a 20ml deluxe sample of new Whitefficient Clear Brightening Gentle Cleansing Oil. Enter code BRIGHT at checkout. Valid thru Mar 27. SkincareRx offers free 7 free Deluxe Samples Kit with every $200 purchase. Kit includes Glytone Step-Up Mild Gel Wash, DDF Wrinkle Resist Plus Pore Minimizer, Cosmedix Refine Refinishing Treatment 4%, DDF Ultra-Lite Oil-Free Moisturizing Dew, Atopalm Intensive Moisturizing Cream, DDF Brightening Cleanser, and Suki Jump Start Nourishing 7-pc Face + Body System Kit. Enter code GWPBUNDLE at checkout. Valid thru Mar 28. Skinstore offers 20% off any purchase. Enter code SPR20 at checkout. Valid thru Apr 9. Tarte offers free shipping and a free LipSurgence Lip Tint in Charmed worth $24 with any $75 purchase. Enter code CHARMED at checkout. Valid thru Mar 31. The Body Shop offers free shipping and selected items for $10 only. No code needed. Valid for Mar 27 only. Yves Rocher offers a free Lavendar Foot Kit worth $24 with any purchase. Top up your purchase to $45 and receive a 3-pc Freshwater Pearl Set. No code needed. Valid thru Apr 11. Bergdorf Goodman's beauty gift card event will be happening soon. Starting Apr 16, you will enjoy $200 off any $1000 beauty purchase, or $75 off any $500 beauty purchase. More details will be udpated once I have them. I'm thinking of getting $400-$500 worth of items. If any of reader girls would like to purchase together with me, please drop me a comment here! BareMinerals offers Faux Tan Sunless Tanner, Moisturizer and Shimmering Moisturizer for only $29.50 (50% off from original price $58). Enter code TANNED at checkout. Valid thru Apr 1. Biotherm offers free shipping with any $50 purchase. Enter code SHIPMAR at checkout. Valid thru Mar 31. Bobbi Brown offers a limited edition Bobbi Brown compact mirror with any $75 order. Enter code LWEYE12 at checkout. Valid thru Mar 29. Clinique offers free shipping with any Even Better Clinical purchase. No code needed. While supplies last. Dermstore is having a Blowout Boutique Sale. Everything in the sale is at $15. No code needed. Enter thru link. Valid thru Apr 1. Dr. Dennis Gross Skincare offers a sample of New Glow Pad for Body with any $35 purchase. Enter code TRAVEL at checkout. Valid thru Apr 1. Dr. Perricone offers a free Gental Cleanser worth $39 with any $150 purchase. No code needed. While supplies last. Estee Lauder offers a deluxe sample of Perfectly Clean Splash Away Foaming Cleanser with $35 purchase. Enter code SPLASHAWAY at checkout. While supplies last. Everyday Minerals offers 40% off any brushes purchase. Top up your spending to $21 to use code Spring and receive Happiness Bronzer Mini & Stay Cool Eye Shadow in Travel Size. While supplies last. Hautelook is having a Philosophy sale event today and tomorrow. Jurlique is having Spend More Save More event. Receive $15 off any $75 purchase with code SPRING15, $40 off any $150 purchase with code SPRING40, $100 off any $300 purchase with code SPRING100. Valid thru Mar 28.
kgbdeals offers $15 for $30 voucher on beautyclub.net. Kiehl's offers free shipping and a deluxe sample of Creme de Corps with any full sized Creme de Corps collection purchase. Enter code BODYCARE at checkout. Valid thru Apr 1. Mario Badescu Skin Care offers free shipping and an additional 10% off with any $50 purchase. Enter code CMONDAY at checkout. Valid for Mar 26 only. Neostrata offers free Exuviance Rejuvenating Complex with any $100 purchase. No code needed. While supplies last. Perfume.com offers 15% off all Sales. Enter code SUPERSALE at checkout. Valid thru Apr 1. Philosophy offers free Birthday Grab Bag with any $75 purchase. Enter code bdaysurprise at checkout. Valid thru Mar 29. Sephora offers free sample Hourglass No. 28 Primer Serum with any $25 purchase. Enter code PRIME28 at checkout. While supplies last. Thymes offers 50% off selected Home Fragrances. No code needed. While supplies last. Trish McEvoy offers free shipping and deluxe travel size of Eye Base Essentials Bare with any order. No code needed. Valid thru Mar 30.
feelunique.com is having Easter Treats event. Get £3 off with any £25 purchase with code 3BLOOM, £5 off with any $40 purchase with code 5BLOOM, £10 off any £75 purchase with code 10BLOOM, or £15 off any £100 purchase with code 15BLOOM. Valid thru Apr 1. Caudalie offers a special offer at Sephora. Purchase 2 products from the Vinoperfect Range and you will receive 2 deluxe gifts. While supplies last. 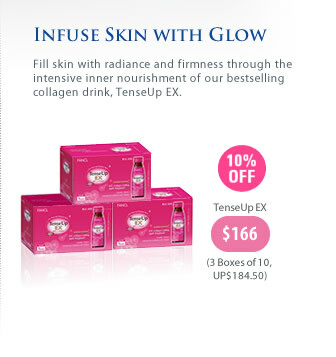 Fancl is offering 10% off with purchase of 3 boxes of TenseUp Ex. 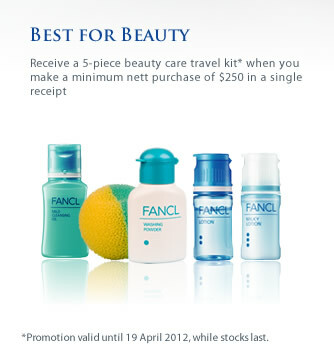 Plus you get to enjoy 5-pc travel kit when you spend $250. Valid thru Apr 19. Laneige is running promotion for their spring collection from now till 31 March. Purchase an eye palette, a sculpting blusher and any lip gloss to receive a $10 Laneige voucher and a beautiful slim pouch. Available at all Laneige counters. Beauty Encounter offers 10% off any purchase. Enter code SPR485. Valid thru Mar 25. Carol’s Daughter offers a free 60ml Hair Milk Original Curl Definer with any $35 purchase. No code needed. Valid thru Mar 25. Caswell-Massey offers free shipping with any purchase. Enter code TSF12 at checkout. Valid thru Apr 1. Clinique offers free Long Last Glosswear SPF 15 mini with any $30 purchase. Enter code PINK for Bamboo Pink shade or SUNSET for Sunset shade. Valid thru Mar 31. Crabtree & Evelyn offers free 3-pc 50g Hand Therapy Sampler with any $125 purchase. Plus they are offering several value sets worth looking at. Valid thru Apr 30. 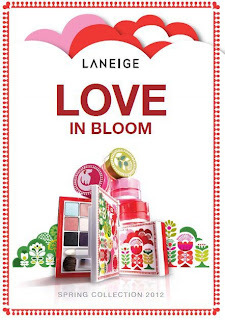 Elizabeth Arden offers 25% off any purchase. Enter code MARCH25 at checkout. Valid thru Mar 25. Elizabeth Arden offers 30% off all Celebrity and Designer Fragrances. Enter code DSFG at checkout. Valid thru Mar 26. Taylor Swift & John Varvatos excluded. H2O Plus offers Buy 2, Get 1 free with purchase of all Spa products. No code needed. Valid thru Apr 11. Hautelook is having BriteSmile and TanTowel sale events today and tomorrow. Juice Beauty offers special value desirable duos. Enter code DUO1 to get $51 valued Complexion duo at $38, DUO2 for $97 valued Antioxidant Powerhouse Duo at $73, DUO3 for $42 valued Skin & lips duo at $31. Valid thru Mar 27. Lab Series offes free shipping with any purchase. No code needed. Valid thru Mar 25. Lavanila offerse a free five piece fragrance sample kit with any purchase. Enter code LAVSAMPLE at checkout. Valid thru May 31. Mark. is having sale for up to 30% off. Enter thru link. While supplies last. Origins offers free shipping and free 1-month sample with any purchase. Enter code ZING1 for Modern Friction Nature's Gentle Dermabrasion, ZING2 for Drink Up Intensive Overnight Mask to Quench Skin's Thirst, ZING3 for Clear Improvement Active Charcoal Mask to Clear Pores. Valid thru Mar 27. Perfume.com offers free shipping with any purchase. Enter code FREESHIP at checkout. Valid thru Mar 25. Proactiv offers the Dark Spot Corrector free with any order. Plus free Shipping for a Limited Time. No code needed. Enter thru link. Sally Beauty offers $15 off on any $60+ purchase of Dryer. Enter code 444123 at checkout. Or $10 off any $33+ dryer purchase with code 444128, and $5 off any dryer purchase with code 444123. Valid thru Mar 31. Sally Beauty offers Free Brush, Bowl & 4oz. developer with any Ion Permanent or Demi Permanent Hair Color purchase. Enter code 555190 at checkout. While supplies last. Sephora offers free shipping with any purchase made at beta.sephora.com. Enter code NEWSITE at checkout. Limited time only. Sephora offers free mini Shiseido mascara with any $25 purchase. Enter code FULLDEF at checkout. While supplies last. Skin One offers 20% off Dermalogica Intensive Moisture Balance. Enter code Vote20 at checkout. Valid thru Mar 25. Soap.com offers 50% off over 150 select Hair Tools. Enter code HAIRTOOLS at checkout. Valid today only. Stila offers free shipping with any purchase including award-winning eye shadow palette In the Light. Enter code INTHELIGHT at checkout. Valid thru Mar 25. The Body Shop offers Buy 3 Get 3 free or Buy 2 Get 2 free sitewide. No code needed. Valid thru Mar 25. Too Faced Cosmetics offers a free deluxe Chocolate Soleil Bronzer with any purchase including any item from the New Summer Collection. Valid thru Mar 31. ULTA is running their 21 Days of Beauty event still. Today they are having $9.99 Benefit Prrrowl (worth $28), Sat is having 50% off bareMinerals mascaras and 25% off Mario Badescu. Sunday is having 20% off any Boscia and 50% off Benefit Realness of Concealness kit. ULTA offers $15 Off $75 with free Shipping. Enter Code AFP312 at checkout. Valid from Mar 25 to Apr 28. Wei East offers choose 5 products for only $29.99. No code needed. WEN offers free shipping with purchase of Limited Edition Spring Gardenia Green Tea. No code needed. Enter thru link. Yves Rocher offers free shipping with any $20+ purchase. Enter code YR20FS at checkout. Plus they are having a lot of spring collection on sale for up to 50% off. Valid thru Mar 25. BareMinerals offers Face Shaping V Brush, Quick Change Brush Cleaner and Well-Cared For Brush Conditioning Shampoo for only $20 ($27 value). Enter code BRUSH20 at checkout. Valid thru Mar 25. Beauty.com offers free deluxe sample of Ojon damage reverse Restorative Hair Serum with any $10 purchase. Enter thru the link. While supplies last. Carol's Daughter extended free shipping with every order offer to midnight Mar 22. Dermstore offers 15% off any Bliss purchase. No code needed. Valid thru Mar 29. E.L.F. offers $1.99 shipping on all orders over $15. Use code 199SHIP at checkout. Valid thru Mar 26. Estee Lauder offers free deluxe travel sizes of Perfectionist [CP+] Wrinkle Lifting Serum and Time Zone Night Anti-Line/Wrinkle Creme with any $50 purchase. Enter code DAYNIGHT at checkout. Valid thru Mar 25. MAC Cosmetics offers free shipping with any order. No code needed. Valid thru Mar 25. Sally Beauty offers 20% Off any Purchase of $50+. Enter code 555130 at checkout. Valid for Mar 22 only. Trish McEvoy's 20% off sitewide promotion is still on. Enter code TMMARCH20 at checkout. Top up your purchase to $50 for free shipping and free deluxe travel size of Treatment Foundation Beige and Instant Eye Lift plus. Valid thru Mar 23. Giorgio Armani at Takashimaya offers a free GA Beach Tower with $130 purchase. 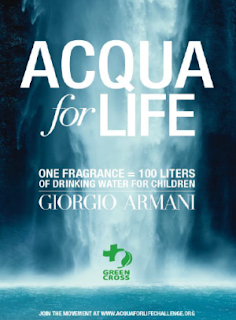 Top up your spending to $150 to receive an Acqua Di Gioia Essenza or Acqua Di Giorgio Armani miniature. Shiseido at Metro Paragon and Metro Woodlands offers a 6-pc gift set with any $160 spend. 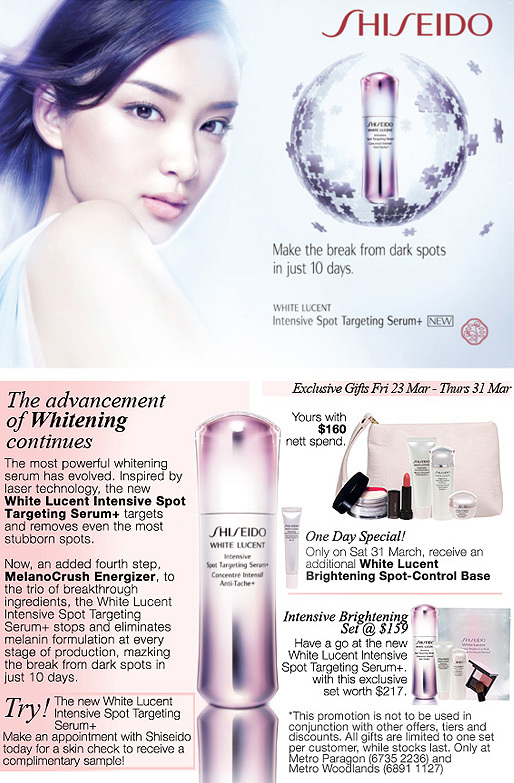 On Sat 31 Mar, you get to receive an additional White Lucent Brightening Spot-Control Base as well. Meanwhile they are also offering free samples with consultation and some skincare set. Click for the details below. Shu Uemura is throwing a Japanese kimono experience this Friday 7pm, at Shu Uemura ION Orchard. You will get to discover their limited edition Mamechiyo for Shu Uemura collection currently exclusive only to ION, plus some fun filled activities are lined up. 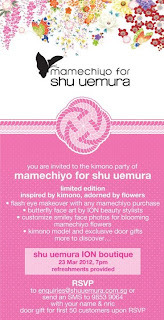 To RSVP, send an email to enquiries@shuuemura.com.sg or send an SMS to 9853 9064 with your name & nric. Door gift for first 50 customers upon RSVP. AHAVA offers free shipping with any purchase. Enter code MINBOSHIP at checkout. Valid thru Mar 23. Burt's Bees offers a free body lotion with purchase of $40. No code needed. Valid thru Apr 3. Beauty Encounter offers 10% off with purchase of selected fragrance and beauty in spring collection. Enter code SPG346 at checkout. Valid thru Apr 8. Clinique offers deluxe samples of New Moisture Surge Intense Skin Fortifying Hydrator and Moisture Surge Extended Thirst Relief with any $30 purchase. Enter code DUO at checkout. Valid thru Mar 25. Dermstore offers free travel size of SkinMedica Vitamin C+E Complex worth $27 with any $75 purchase. No code needed. While supplies last. Dermstore offers 10% off any purchase of Jan Marini with any purchase. No code needed. Valid thru Mar 25. Drugstore.com offers 20% off any purchase. Enter thru link. Valid thru Mar 23. Elizabeth Arden offers free shipping for you and your BFF. Enter code BFFS3 at checkout, and the code can be used twice. Valid thru Mar 26. Hautelook is having a Sjal Skincare, Wet Line Pro, and Caswell-Massey sale events today and tomorrow. 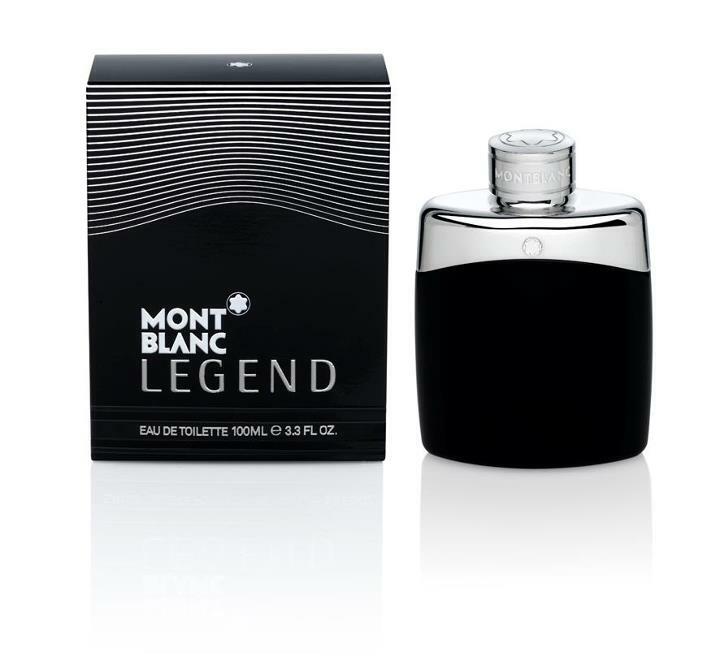 Jack Black offers a free 90ml All-Over Wash for Face, Hair & Body with any $60 purchase. Enter code WANTED2012 at checkout. Valid thru Mar 28. Jurlique offers a new Brightening Set at $68. The set worth $103 includes 40ml Skin Brightening Day Cream, 40ml Skin Brightening Night Treatment and 5ml of Skin Brightening Essence. While supplies last. Origins offers free shipping with any purchase. No code needed. Valid thru Mar 22. Perfumania.com offers 20% off with purchase of Lacoste or Calvin Klein Fragrances. No code needed. Valid thru Apr 16. Sabon offers 25% off with purchase of Lemon Basil, Tropic, Violet, and Fig Coco Collections. No code needed. No code needed. Valid thru Mar 26. Scentiments offers free shipping and 10% off sitewide. Enter code MARCHMAD at checkout. Valid thru Mar 31.